Originally published in September 2014 by the Navisio Global Publishing Unit. After several weeks of bloody fighting during what they termed “Operation Libya Dawn”, on 23 August militias from the town of Misrata finally conquered Tripoli International Airport from their adversaries, the Zintani. The capture of the airport and expulsion of the Zintani marks the achievement of the Misrata’s military objectives after losing recent elections for Libya’s interim parliament, the House of Representatives (HoR). Fearing political marginalization in Tripoli in the face of the more established Zintani, the militarily superior Misrata saw this as their only remaining alternative. With Tripoli finally under their control, the struggle for Libya’s capital appears to be decided, at least for the time being, but as the Misrata prepare their next steps, the international community faces a narrowing window of opportunity to achieve a stable solution in Libya. several militias of the Misrata coalition are led by (radical) Islamists; some of whom are former members of the Libyan Islamic Fighting Group, an organization that produced several prominent Al Qaeda leaders like Abu Yahya al-Libi who was Al Qaeda’s number two when he was killed by an American drone strike in 2012. After their military success the Misrata are widely unchallenged in the capital where they are busy consolidating their positions and solidifying their control of the city. This includes acts of revenge against members and property of the Zintani coalition that remained in Tripoli, and against the Tawergha, who were dispersed from their own city by the Misrata in 2011 because of their support for Gaddafi during the revolution. The Zintani brigades have withdrawn to their strongholds in the Jabal Nafusah mountains, scene of their May 2011 victory over Gaddafi’s mighty army. There they are reorganizing their troops while trying to resupply. Though it is very unlikely that Libya Dawn forces will be able to mount a successful attack on the Zintani stronghold, a successful Zintani counterattack from there can also be ruled out for the near future. Thus, the former military stalemate in Tripoli is replaced with a stalemate in northern Tripolitania. The Misrata wasted no time shifting their efforts to the political side. On 25 August, they unexpectedly resurrected the former General National Congress (GNC) – an embarrassment to many people that voted for the HoR. Replaced by the HoR in the recent elections, the original 200 member GNC was elected in 2012 as the first interim parliament of Libya. Though the strongest single party in the GNC was the liberal-leaning National Forces Alliance of the first interim Prime Minister, Mahmoud Jibril, a block of various Islamists widely dominated the original GNC. Though the estimated number of parliamentarians that showed up to vote varied from a few dozen to as many as 94 (the former minimum requirement for quorum), the GNC nevertheless designated the Islamist Omar al-Hassi the country’s new, but hardly legitimate, prime minister. [Of the 200 seats in the GNC only 80 were allocated to political parties. Of these Jibril´s NFA got 39, the JCP (close to the Muslim Brotherhood) got 17. The remaining 120 seats were for independent candidates. The Islamists managed to drag many of these “independents” on to their side and formed an “Islamist block” in the GNC. -WP]. Meanwhile, the interim government of the legitimate Prime Minister, Abdullah al-Thani, resigned on 28 August to make way for formation of a new government. Within days however, al-Thani was asked to again form a government with the HoR leaving Libya with two competing legislatures and divided both militarily and politically. The next objectives of the triumphant Misrata will be to safeguard their achievements by military, political, and economic means. Militarily they must protect the western flank of their positions in Tripoli and keep open the vital coastal road to Tunisia. This will take them and their local allies, the “Knights of Janzour” and “Libya Shield West”, deeper into the tribal areas of the Wrishfana (confederates of the Zintani) where the first clashes have already begun. Politically the Misrata are attempting to overcome their recent electoral defeat by simultaneously offering incentives and applying increased pressure. While Libya Dawn forces invited the HoR to move to Tripoli and guaranteed the security of its members, it may be that by initiating the designation of a new prime minister, the Misrata want to force the HoR to select a compromise candidate as a head of the future government. This would be even easier for them if the legitimate interim parliament were located in Tripoli as their militias (like several others) are already well experienced in blackmailing parliamentary assemblies. The fact that the HoR again asked Prime Minister Abdullah al-Thani to form a cabinet despite his repeated insistence that he does not intend to continue serving, could be an indication that the HoR wants to keep open the door for negotiations with the Misrata. It remains to be seen how long they intend to stick to the old assembly and its weak, compliant president Nuri Abu Sahmain. Whatever the case, the very dangerous idea of reviving the GNC could eventually contribute significantly to the split of the country. Political maneuvers and military campaigns will have little sustained impact however if the economics aren’t there to sustain the effort. For this, the Misrata know they must gain control of at least part of Libya’s hydrocarbon wealth. 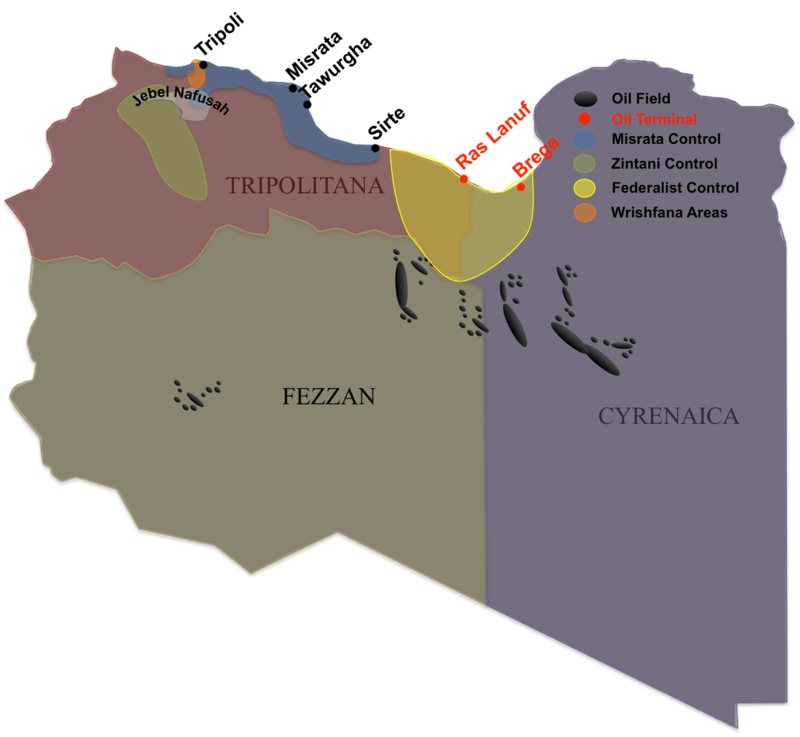 Though the coastal strip from Sabratha to Tripoli and further on to Misrata and Sirte is now, with some exceptions, under control of the Misrata and their allies, this does not include a significant part of the hydrocarbon infrastructure (other than the refinery in Zawia) or water sources of the Great Man-Made river. These resources are decisive for any Libyan government and therefore it can be expected that the Misrata will try to gain influence by political or military means over the oil fields in the Sirte basin and the oil terminals on the coast of Gulf of Sirte (Ras Lanuf, Brega etc.). Those facilities are currently more or less under the control of the federalist Ibrahim Jadhran, who had blocked oil exports for months. Misrata will also try to get the oilfields in the south under control, but this is much more difficult. Several of those fields are under firm control of tribes allied with the Zintani and the pipelines to the coast run through or close to Zintan controlled territory where it would be easy for Misrata’s opponents to interrupt the vulnerable tubes and attack the pumping stations. The situation in Libya looks dire. There are four likely scenarios in the midterm (in order of decreasing likelihood): sustained multilateral civil war or “Lebanonization” of the country; an international intervention in the form of a peace-support operation; a political solution; or a decisive Islamist victory. It is also quite realistic that there will be a combination of the first two scenarios. For example, a peace-support operation limited to the critical area in and around the capital may not prevent civil war from raging in several other parts of the country. While mention of peace-support conjures images of European armies patrolling tense neighborhoods, we must also consider the possibility of an Egyptian intervention in the form of establishment of a “Ground Safety Zone” on the Libyan side of the border. After all, Europe is not the only place for which instability in Libya presents a security problem. There may however be a narrow window of opportunity to prevent the country from descending into total chaos. The UN Security Council recently called for an immediate ceasefire but implementing such a measure will not be easy (see United Nations Security Council Resolution 2174). Politically, the current situation of divided government is inimical to a settlement there. Therefore it is absolutely vital that the international community force all parties to the negotiating table to accept the HoR as the only legitimate representative of the Libyans. To this end there must be focused support on moderates in Misrata and in Zintan to prevent the “hawks” from dominating. Countries like Turkey, Qatar, and the United Arab Emirates must be convinced to influence their Libyan partners to keep a ceasefire and commit themselves to the democratic process. Sanctions against individuals are a good tool although they will not have a quick impact. They must include political, military, and militia leaders as well as religious leaders from all groups unwilling to accept and support the democratic political process. Though these sanctions will make the daily business of the few remaining embassies in Tripoli even more difficult, their current situation is already forcing them to operate in a state of crisis. Lastly, armed groups not entirely subordinated to the will of the legitimate government must be withdrawn from the capital, regardless which faction they come from. This must be achieved by international political pressure, a political compromise in Libya and, if necessary, by an accompanying international military Peace Support Operation. Such an International Stabilization Force would be a last resort to prevent a Libyan collapse (see Wolfgang Pusztai, “An International Stabilization Force for Libya?”), but as the preparations for such an operation takes months it is necessary to start the discussions and preparations now. Wolfgang Pusztai is a freelance security and policy analyst. He was the Austrian Defense Attaché to Libya from 2007 to 2012. Libya may have to move those oil wells to a higher level of uninhabited desert and drill deeper into the rest of the sand until it’s coal mine explored for possible future discovery for a highly fast paced profitable vein.